U.S. Softball Streak Ends, Beach Volleyball Continues The U.S. softball team was denied a fourth straight Olympic gold medal, losing 3-1 to Japan. 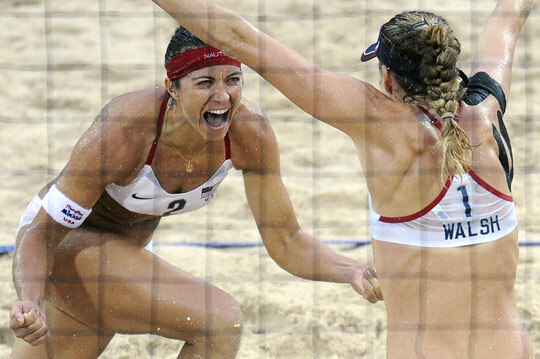 The upset came on the same day that beach volleyball phenoms Kerri Walsh and Misty May-Treanor outspiked a Chinese team for a second consecutive Olympic championship. Americans Misty May-Treanor (left) and Kerri Walsh celebrate their Olympic gold medal victory over China's Tian Jia and Wang Jie in women's beach volleyball in Beijing. 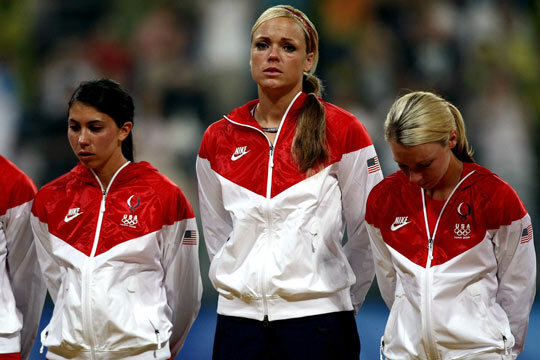 Andrea Duran (from left), Jennie Finch and Caitlin Lowe of the United States prepare to receive their silver medals after their team lost, 3-1, to Japan during the women's final medal softball game in Beijing. 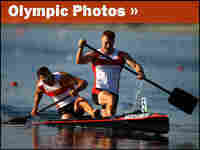 Explore the Summer Olympics in pictures. Such is life. Hot on the heels of the U.S. gold-medal success in women's beach volleyball at the Summer Olympics on Thursday, the American softball team saw its golden dreams turn to silver, losing 3-1 to Japan. But even later in the day, the defending champion U.S. women's soccer team won the gold medal for the third time in four Olympics, beating Brazil, 1-0 in overtime. The American streaks of three softball golds and 22 victories in a row were snapped as Japanese pitcher Yukiko Ueno handed the U.S. women their first loss since the 2000 Sydney Games. It's the sport's final appearance in the games for at least eight years. The International Olympic Committee voted softball off the 2012 program in London, but proponents of the sport hope it will be reinstated next year in time for the 2016 games. On the upside, U.S. beach volleyball pop-cult phenoms Kerri Walsh and Misty May-Treanor outspiked China's Wang Jie and Tian Jia 21-18, 21-18, in Thursday's gold medal final. • The contest was between the two dominant countries of the games. • Beach volleyball is a relatively new Olympic sport that, unlike the shot put or the parallel bars, is usually played on sunny beaches by scantily clad, beery-eyed weekend jocks. • The final match featured amazing female athletes, self-sure and self-deprecating at the same time. Walsh and May-Treanor have won two gold medals in a row. • At the Day 13 event, there was rock music and a shimmying cheer squad that might have made ancient Olympians do a Fosbury flop in their graves. • The game was played in a difficult 21st century environment — a smoggy Beijing rain. "The rain makes it better. We felt like warriors out there," Walsh told The Associated Press after the event. The downpour "is just another reason why we play in bathing suits," May-Treanor said. In women's volleyball (the indoor variety), the U.S. beat Cuba, 3-0, in a semifinals match. The Americans will play for gold Saturday against Brazil, which topped China, also 3-0. In women's soccer, Carli Lloyd scored in the sixth minute of extra time for the Americans, who beat the Brazilians for a second straight Olympic final. Earlier, world champion Germany defeated Japan 2-0 in the bronze medal game. In other Olympic results: Maarten van der Weijden of the Netherlands nabbed the gold in the men's marathon 10-kilometer swim. In women's water polo, Australia outlasted Hungary, 12-11, to win a bronze medal. In celebration, Australian coach Greg McFadden leapt into the pool with his players. Russian racewalker Olga Kaniskina also endured the drenching rain to win the gold medal in the 20-kilometer event. In women's team handball, China swept past Sweden 20-19, and France beat Romania 36-34. Controversy du jour: Jacques Rogge, president of the International Olympic Committee, objected to the taunting, NBA-style antics of Jamaican supersprinter Usain Bolt. Rogge said that Bolt dissed his fellow competitors by showboating while winning gold medals and setting world records in the 100- and 200-meter races. "That's not the way we perceive being a champion," Rogge told the AP.